Check our calendar of events for history programs, holiday events, and more! 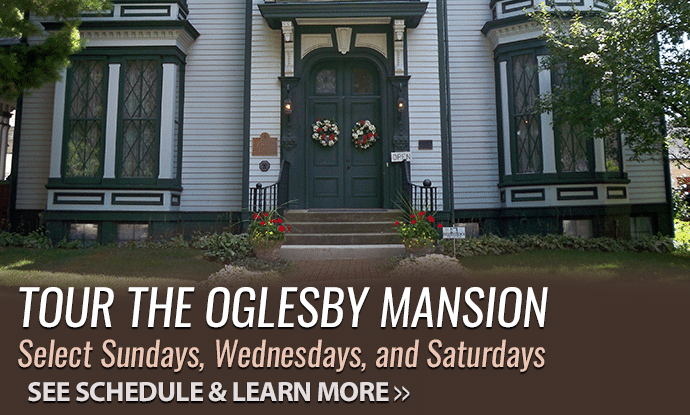 There’s always something fun happening at the Oglesby Mansion. The Governor Richard J. Oglesby Mansion, located on the west end of Decatur, Illinois, is open for tours. Host your event or reception in the Governor Oglesby Mansion! The Mansion is a very special place that can provide an elegant atmosphere for your important occasion. There are many ways to get involved in the work of the Governor Oglesby Mansion. Richard J. Oglesby is recognized as one of Decatur’s most distinguished citizens. He served his country well as a U.S. Senator, a Union General in the Civil War, a three-term governor of Illinois, and a close friend and colleague of Abraham Lincoln. The Mansion was built in 1875-76 after his second marriage. The original plans for Oglesby Mansion were by William LeBaron Jenney, a Chicago architect who was best known for designing the first modern skyscraper. The Oglesbys modified the plans a great deal and hired a local contractor to build the house for them. Two of their four children were born while they lived in the house. In 1882 they moved to Lincoln Illinois and then to Elkhart where they built a much larger house on Elkhart Hill. The house was sold to James E. Bering in 1882 and he and his descendants lived in the house until 1972. At that time, the Mansion was purchased by the Macon County Conservation District with a state grant. Restoration began in 1976 and continues today. The care and restoration of the house is under the direction of the Governor Oglesby Mansion, Inc.
Each year Oglesby Mansion Players present “President Grant’s Visit to Decatur” for area fifth grade school children. The performances are scheduled for April 29 – May 3, 2019, at the Mansion. Save the date to dine with Governor Oglesby at our 10th annual event! The Governor Richard J. Oglesby Mansion is open for tours. Plan your visit today!